A new study is causing quite a stir about the nation's duck population. The study published in the journal BioScience says within 50 years, the number of ducks in the United States could drop dramatically. The Upper Midwest is prime breeding ground for more than half the world's duck population. There are differing views of how to preserve waterfowl habitat. Sioux Falls, S.D. — Duck hunters have a passion for their sport. Many hours go into building decoys and duck blinds. Biologist Kurt Forman works for the U.S. Fish and Wildlife Service, and he's also a duck hunter. Forman believes his sport could be in trouble. "The fate of waterfowl hunting in the U.S. will be largely tied to the fate of the grasslands and wetlands in the central Dakotas," says Forman. That's because nesting habitat in Canada is disappearing, and ducks are forced to nest more in the Upper Midwest. Forman oversees a program that pays farmers and ranchers to keep grassland and wetlands in their natural state. The program is funded mostly through donations from duck hunters. But the new research published in the latest issue of BioScience shows that perhaps Forman should change his focus. Carter Johnson, an ecology professor at South Dakota State University, conducted the study which looked at how climate changes will impact the breeding ground for waterfowl. He says it's getting warmer in the Upper Midwest, and that warmer weather means wetlands will start to dry up. Johnson says the area that is currently productive for waterfowl won't be in the next 100 years. "Everything will shift to the east," says Johnson. "The more favorable climate in the future will be western Minnesota and extreme fringes of the Dakotas. The problem with that is we've drained almost all of the wetlands." Instead of putting a lot of money into other areas that have been more productive in the past, we could shift the funding to areas that will be better in the future. The area is called the Prairie Pothole Region. 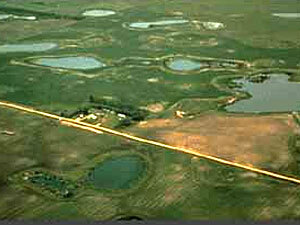 It contains about five million small ponds spread across the Dakotas, western Minnesota and Iowa, and into Canada. Fifty years ago, the federal government funded the draining of wetlands in western Minnesota and Iowa, so more acres could be used as cropland. Now, Carter Johnson says, because of climate changes we have to get those wetlands back. "Instead of putting a lot of money into other areas that have been more productive in the past, we could shift the funding to areas that will be better in the future," says Johnson. Johnson is also encouraging farmers to switch from row crops like corn and soybeans to wheat or grazing land, as a way to conserve water for wetlands. But Kurt Forman with the U.S. Fish and Wildlife Service says the breeding pattern of ducks is less about wetlands and more about grasslands. He says the wetlands attract the birds, but they nest in the grass. Forman says the breeding grounds for ducks used to stretch from the Dakotas into Canada. But now there's less habitat in Canada. That shift is showing up in the numbers. In 2001, there were more breeding pairs of mallards in the United States than in Canada. It's Kurt Foreman's goal to have 40 percent of the land in South Dakota's Prairie Pothole Region in natural grass. "If we can't hold the line here, then there is no backup plan," says Forman. "We need to conserve that 40 percent habitat base in the central Dakotas. It just doesn't benefit duck hunters in South Dakota, it benefits duck hunters and bird watchers in every state in this country." Forman says he'll continue to focus on grassland restoration, and use money from conservation groups to do it, regardless of the predictions. He says it will take more to restore wetlands than to preserve what we already have. He believes a focus on grasslands is smart, because once they're gone we can't get them back.